Candy bars have always been guaranteed money-makers. Did you know that 98% of households buy candy? With interested buyers everywhere, you’ll make faster sales and more profit! We offer your group America’s most popular brands. All boxes of candy bars are compact and come with a handle for easy use. Public schools can pay with a purchase order. As always, shipping is free on all orders. The original ONE DOLLAR BAR America’s Variety carrier is our preferred candy bar fundraiser. It includes a selection of five different candy bar choices, including the popular milk chocolate almond bars and crispy rice! Order as little as 1 case at at time and get free shipping. The new Chocolatiers candy bar collection features 4 different chocolate bar choices including creamy caramel, roasted almonds, crispy rice and milk chocolate. 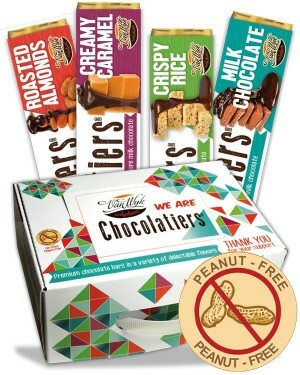 They are 100% certified peanut-free chocolate. Minimum order is only 1 case and you always get free shipping. The new $2 Chocolatiers Variety Pack offers great tasting premium chocolate in a bigger format, 2.25 oz. Selling the larger $2 candy bars means you raise your funds more quickly, and you raise 47% to 60% profit. Everyone will love the Hershey Max Variety Pack - it contains 6 different candy bars that are as adored as much as they are known. Expect your supporters to come clamoring for more, thanks to the great tastes and cheap prices. Please note: 4-6 week delivery time. Minimum order of 5 cases. You'll have a pre-established customer base with the sweetly familiar tastes of our Hershey's candy bars - Kit Kat, Hershey's chocolate, Twizzlers, and Reese's Pieces. Your supporters will not stop at just one! Please note: 4-6 week delivery time. Minimum order of 5 cases. Your supporters will love the familiar sweet taste of Hershey's chocolate, and will love the super-size format even more! Priced at only $2, your supporters now get to eat more of what they enjoy, while your group makes twice the profit with every bar sold! Please note: 4-6 week delivery time. Minimum order of 5 cases. We’ll Ensure Your Next Candy Bar Fundraiser is Effortless! Public Schools use a Purchase Order Form to place their order. Proven selection of candy bars - the various flavors have been tried and proven over many years, to come up with the perfect selection that will sell best! Our customer service team is here to help you from the beginning to the end. 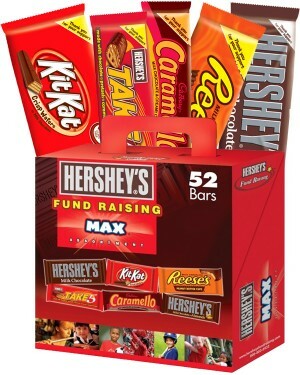 Choosing the right candy bar fundraiser is the first step to a successful fundraising campaign, and our experts will help you do just that. 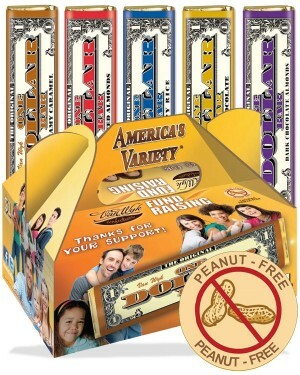 $1 America’s Variety candy bar fundraiser: each master case contains 4 carrier cases. Groups really like it because it features 5 flavors which mean there’s something for everyone. Even with a minimum order of 1 case, you earn 41% profit and free shipping. $2 Community Chocolatiers: I like this one because of it’s simplicity and profitability. It contains only the 3 best-selling flavors, and you start making 50% profit on a 1 case order (and climbs as high as 65% profit). 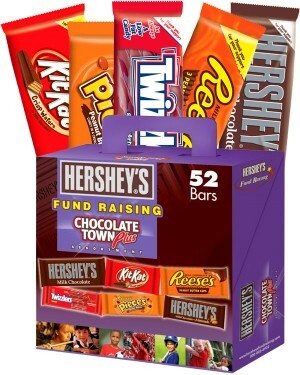 Which candy bar fundraiser is best for you? 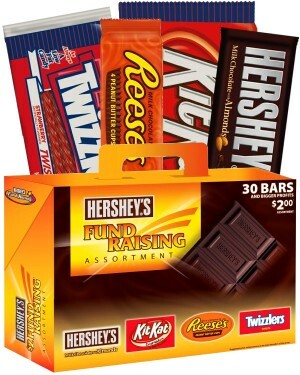 As you can see, JustFundraising carries several candy and chocolate bar fundraising products. We realize that every group is different and that it’s important to find the right one. If your group has done specific candy fundraisers in the past that have been highly successful, stick with what works. If you’re new to fundraising, review the following tips, including pricing and branding considerations. Should You Sell $1, $1.50 or $2 Candy Bars? Each of them has their pros and cons. The $2 candy bar fundraisers have a higher percentage profit than the $1 bars – some range from 50% to 65% profit versus the $1 bar ranging from 35% to 50% profit. $2 bars also sell for twice as much which adds up to even more profit for your group. However, will you be able to sell as many $2 bars as $1 bars. The $1 candy bars are a no-brainer because everyone is familiar with paying $1, and many supporters may actually purchase more than one at a time. The $2 candy bar fundraiser was introduced to fundraising about 10 years ago and people are becoming more familiar and accepting of the $2 price point. However, it really depends on your neighborhood and how price sensitive your buyers are. If you live in a less affluent area, you’ll be safer to fundraise with the $1 bars; if you live in an affluent area, I would go with the $1.50 - $2 bars. If you live in an average income area, you might want to give the $2 bars a go – they could help you raise more, faster! Should Brand Be Important To You? Brands like Hershey’s and M&Ms have been popular in the candy bar fundraising market for decades. However, less known brands like Van Wyk Confections are starting to make inroads in fundraising with very impressive carrier cases and packaging, premium quality chocolate and more aggressive pricing, which means higher profits for groups like yours. 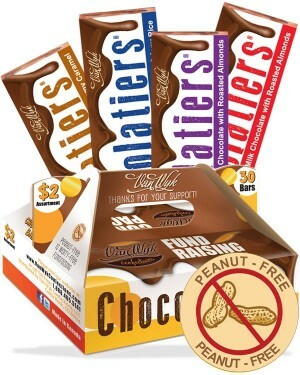 So, yes brand can play a role in your candy bar fundraiser but with so many other contributing factors, including everybody’s desire to simply donate to a worthy cause, it’s role is greatly diminished. Firstly, determine your fundraising objective. Make it realistic. If it’s too high, consider 2 or more fundraisers to reach your fundraising goal. Next, determine how many candy bars each member has to sell in order to reach that goal. Example: if you have 50 sellers, and you need to make $2000 profit, and each candy bar generates 50 cents in profit, you need to sell 4000 candy bars, or 80 bars per seller. Once you’ve figured out the total number of candy bars needed, divide it by the number of candy bars per master case. Example: Each master case of America’s Variety candy bars contains 208 bars, therefore if you determined you needed to sell 4000 bars to reach your goal, you would order 20 master cases (4000/208 bars). It can get complicated, so consider using our Profit Calculator which can be found on every candy bar product page, or call us at 1-888-440-4114. How Do You Pay For This Fundraiser? Don’t have a lot of funds? No problem! JustFundraising helps small groups and small budgets by allowing groups to order as few as 1 case at a time. And you still get free shipping on a one case order. Call us and tell us you’re interested in starting a candy bar fundraiser. We’ll be happy to review the options with you and make some suggestions based on your group type, size and fundraising goals.